Whipped this together with a couple of boards from Lowe's. Used shoe polish(paste) for a stain. Whipped it together in about 30min. What kind of whip did you use? How's it hangin'? No, really, how is it on the wall? Kind of cool man. 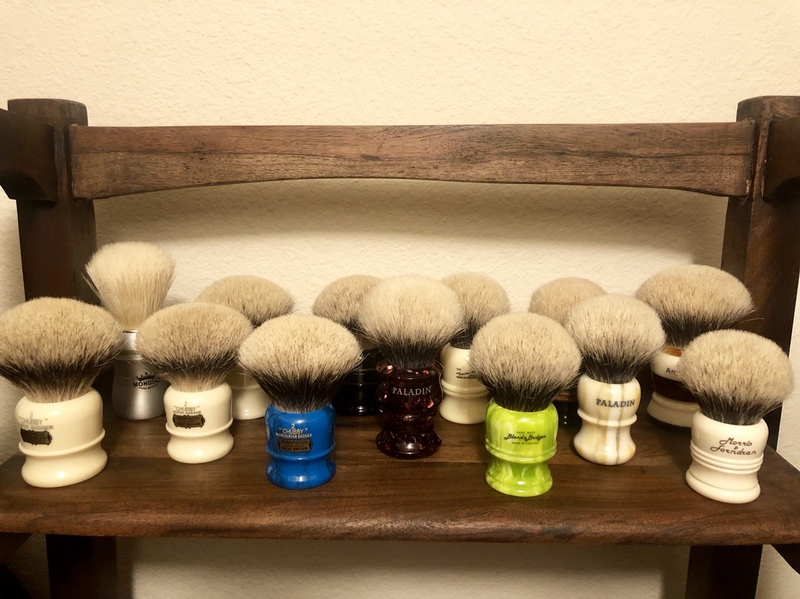 You have some nice looking brushes on there. (08-24-2018, 06:26 PM)TobyC Wrote: What kind of whip did you use? one picture hanger, can be seen in the center....just barely visible. Then a small pin/wire nail in right and left top corner. 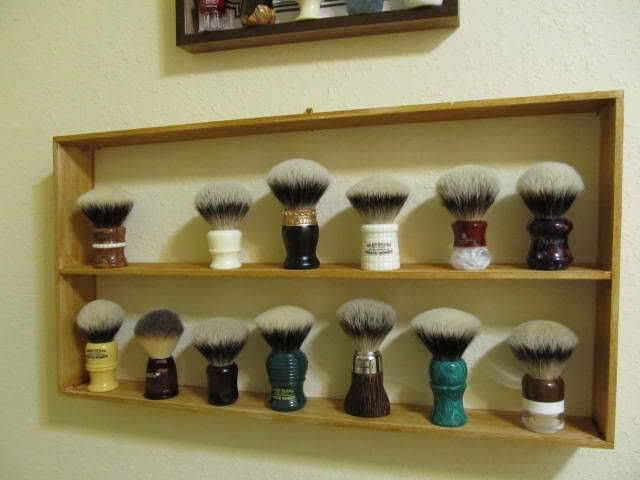 What brand brush is the one on the bottom row, third from the right? Wood base, heavy base? I would say good job & a cute shelf that will definitely serve its purpose. But those BRUSHES steal the SHOW!!! Very nice. I’m looking for a small glass door cabinet. Any options? 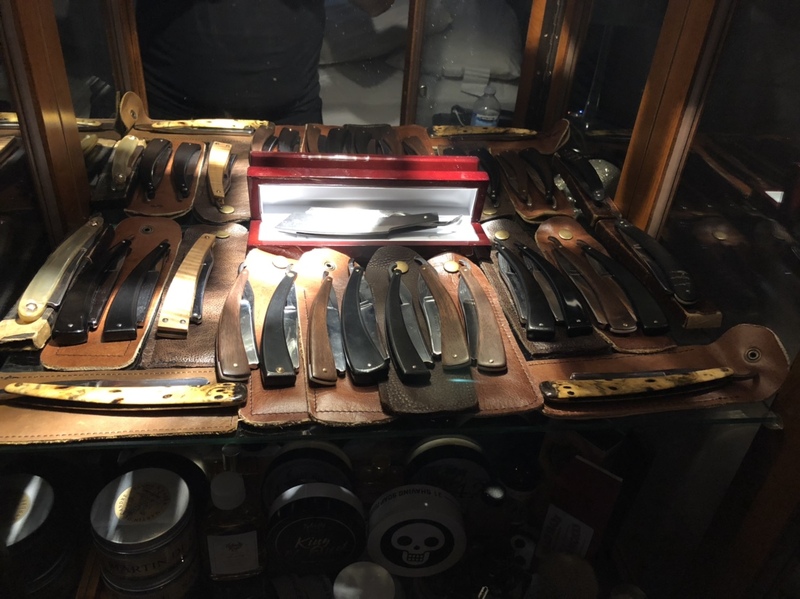 (12-29-2018, 10:47 AM)SimpleShave17 Wrote: I’m looking for a small glass door cabinet. Any options? Painted or natural wood finish? New and painted is fine. Nice setup Garrett. What can you tell us about that wood piece? Garrett, I meant the brush rack. It works out well, but it looks like you need a second one. By the way, you have a nice selection of synthetics. 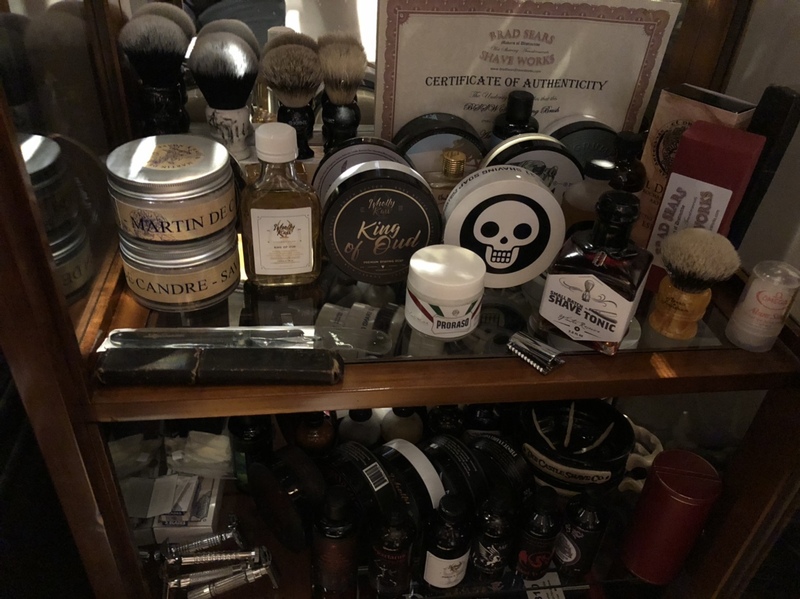 (01-12-2019, 06:03 PM)TheLegalRazor Wrote: Garrett, I meant the brush rack. It works out well, but it looks like you need a second one. By the way, you have a nice selection of synthetics. Thanks. That picture is from a little over a year ago. 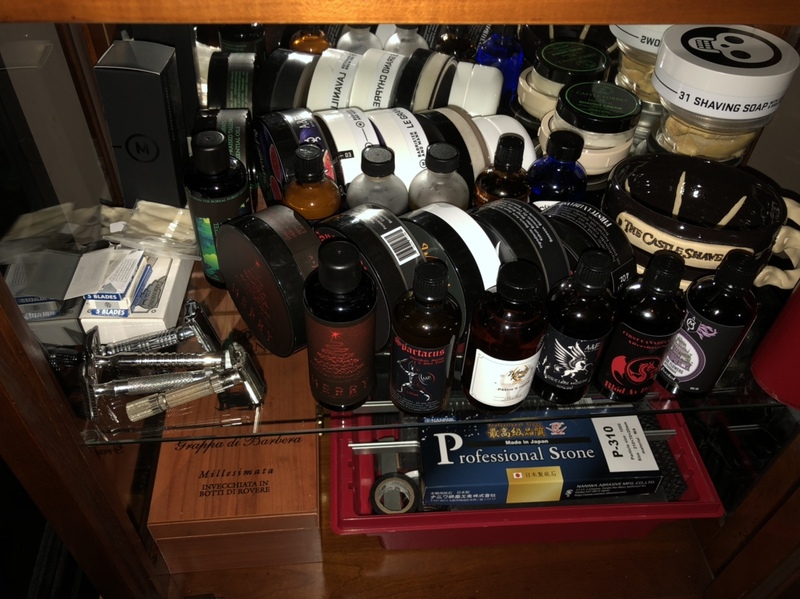 I've given away 1 of them and relegated 2 others to the PIF pile and replaced them with new additions. I'll have to take some new pictures. 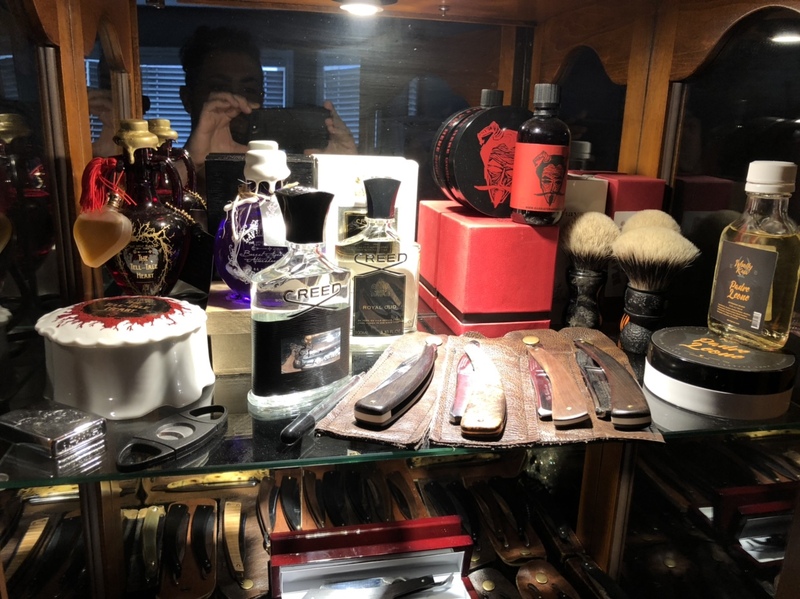 I aso want something that has a glass door for display but keeps them from contamination as I use the spare bathroom as my shave den...........................why doesn't everyone put the lid down when flushing ? ?